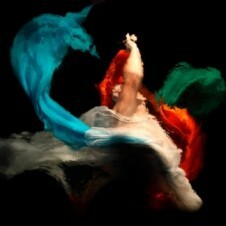 Christy Lee Rogers is a self-taught photographer from Kailua, Hawaii. Her obsession with water as a medium for breaking the conventions of contemporary photography has led to her work being compared to Baroque painting masters like Caravaggio. With an eye for the chiaroscuro qualities of light, her subjects bend and distort; bathing in darkness, isolated by light, and are brought to life by ones own imagination. Without the use of post-production manipulation, her works are made in-camera, on the spot, in water and at night. Her unrestrained joy to excite and inflame the senses, while provoking the audience with vivacious movement and purpose, demonstrates her prolific use of the photographic medium to transform reality into a world of her own.